School of Integrative Plant Science (SIPS) seminar playlist – Were there seminars offered by other sections that you couldn’t get to? Find many of them here, plus SIPS-wide seminars from the Smithsonian’s Kirk Johnson and Sir David Baulcombe. Underground Air Waves: Belt Loop Beans – Looking for some ear candy? Or at least vegetables? Enjoy this plant breeding conversation with Michael Mazourek on the Edible Radio Podcast. 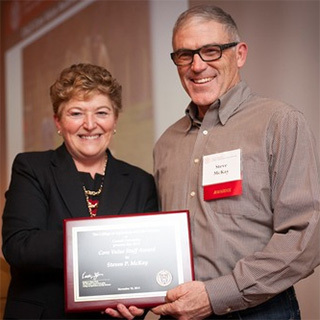 On Nov. 10, Dean Kathryn Boor, Cornell Cooperative Extension Director and Associate Dean Chris Watkins, and more than 100 guests celebrated the College of Agriculture and Life Science’s best and brightest at the 11th annual Research, Extension and Staff Awards. Part of the program was dedicated to the Core Value Staff Awards, created in 2010 and designed to recognize individuals or teams who have gone far beyond the standards defined by Cornell’s Skills for Success. This year the dean presented two awards for Unsung Hero. The award recognizes a team player whose accomplishments extend beyond the guidelines of a specific category. 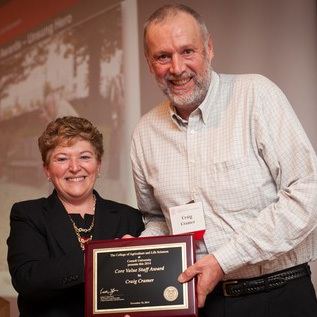 Dean Kathryn Boor presents ‘Unsung Hero’ award to Craig Cramer November 10. The first Unsung Hero Award was presented to Craig Cramer, an extension communication specialist in the Horticulture section in the School of Integrative Plant Science. Cramer is a key point person for the communications needs of the new school. He works closely with CALS Communications to help cover events and accomplishments by faculty, students and staff. He keeps websites updated and evolving, writes blog posts and articles, partners with CALS Communications for press releases, and is an excellent photographer and videographer. He is often found visiting classes or attending field days, conferences, and other events to capture Horticulture’s exciting work in action. In short, he does whatever it takes to get the word out about Plant Science’s exciting research, teaching and extension. Dean Boor also noted that each year, Cramer learns new skills and takes on more responsibilities, even regularly offering seminars to students and extension educators on topics like “writing for the Internet” and “creating digital art.” Masterful at presenting information in an engaging way, he enthusiastically accepts new communications challenges, such as helping a class produce posters that advertise the quantifiable value of trees to our community or editing the “Cornell Guide for Growing Fruit at Home,” which won an award for best new publication. Dean Kathryn Boor presents ‘Unsung Hero’ award to Steven McKay November 10. The second Unsung Hero Award was presented to Steven McKay, farm manager at the Thompson Vegetable Research Farm in Freeville, N.Y.
McKay’s technical role is to support the activities of 20-25 faculty researchers from more than a half a dozen departments who are investigating diverse questions associated with vegetables in New York. He oversees 260 acres of farmland, managing all aspects of land preparation, pest management, staff assignments and equipment purchases. However, Boor said, his impact and reputation have expanded well beyond a support role. He works long hours and is available 24/7, sharing his expertise with faculty and graduate students to help maximize the impact of their results. Field experiments are, by their nature, at the mercy of the elements, but Steve cares so deeply about on-farm experiments that he routinely goes beyond expectations to ensure their success. For example, during Tropical Storm Lee, severe flooding jeopardized field trials at the farm. Due to the mud, it was impossible to use a tractor to apply fungicide treatments to one of the experiments, so Steve trudged through the mucky fields with a backpack sprayer to save the day. During a time when sustainability and efficiency are key, he is a true forward-thinking leader. He has transitioned much of the farm to drip irrigation to reduce water usage by 80 percent, and he shuttered the Thompson lab building to save thousands of dollars annually on heating and utility costs. The dean said his curiosity, creativity and ingenuity benefit everyone who depends on the farm – he is a lifelong learner who is always seeking new and improved practices. She noted that McKay even challenged an engineering class with a contest to design improved drainage and irrigation systems, and then implemented the winning design at the farm. 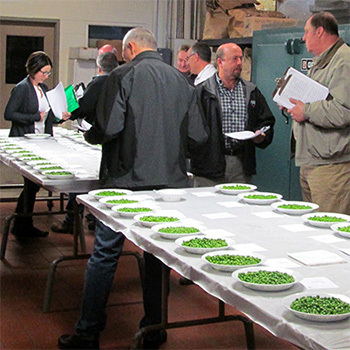 Processor and seed company representatives sample frozen peas at NYSAES ‘cuttng’ November 6, 2015. Jim Ballerstein, Research Support Specialist for Steve Reiners’ vegetable research program has released this year’s processing vegetable variety reports. In November, more than 40 people attended Ballerstein’s cutting at the New York State Agricultural Experiment Station, Geneva, N.Y. to sample 168 varieties of frozen and canned vegetables taste for themselves how the corn, peas and beans performed. Find previous years’ reports and more information on Reiner’s research page. Lisianthus planting in the high tunnel, Snapdragon trial in late May, harvesting the Ammi field trial, Eucomis in high tunnel. Click image for larger view. Calling hours and funeral service for Cathy Heidenreich have been set for Saturday, December 20. Calling hours will be 10:30 a.m. to 12:30 p.m. at the Maranatha Baptist Church, 8721 Travell-Knapps Corners Road, Lyons. A funeral service will follow the calling hours at 12:30 p.m. Family burial will be at a later date in Camden, NY. In lieu of flowers, donations may be given in her name to Maranatha Baptist Church, 7821 Travell-Knapps Road, Lyons, NY 14489 where she was a faithful member. 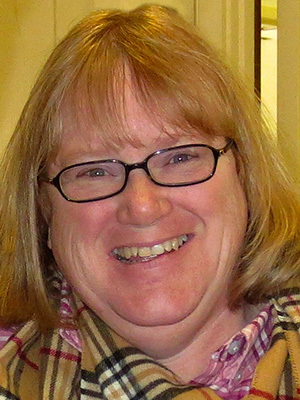 It is with great sadness that I must share the news that long-time member of the NYSAES community, Cathy Heidenreich, was killed earlier today in an automobile accident. Few details are available at this time. 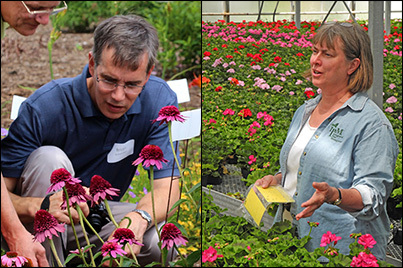 All those in Plant Pathology, Horticulture, Extension and the agricultural community who worked with her knew Cathy to be a valuable, generous, kind and caring member of the many research and extension teams to which she contributed her skill, knowledge, creativity and sense of humor. She brought great credit to Cornell, CALS and the Geneva Experiment Station over many years and her presence will be sorely missed. All of us extend our deepest sympathy to Cathy’s husband, Gregg, and the entire family. Please join us, Wednesday, December 17, 2014 for comfort and coffee at 11 a.m. in Barton Hall, Room A137. Cindy Glanville from the Faculty Staff and Assistance Program will be joining those who wish to attend. Cindy will also be available throughout the day Wednesday. We will share additional information as we learn more. 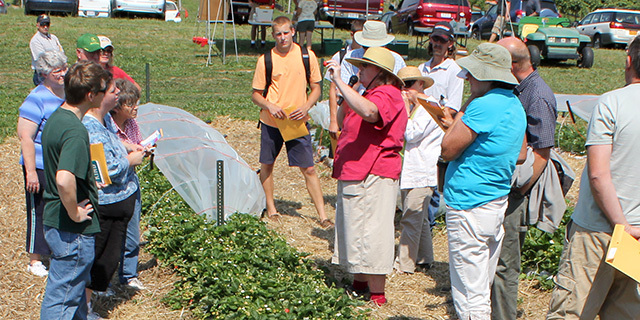 Cathy explains low-tunnel strawberry research to growers at 2012 Berry Open House at Cornell Orchards. LeRoy August Ellerbrock, 72, Associate Professor at Cornell’s Department of Horticulture for many years, passed away unexpectedly at his home on December 12, 2014 after a brief illness. Roy grew up on his parents’ family farm in New Cleveland, OH. There he did the usual chores, helped to tend his father’s large truck garden, and organized baseball games with neighbor boys in nearby fields. Roy went on to graduate from Miller City High School where he was captain of the basketball team and president of the Class of 1960. 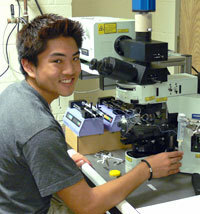 Roy studied Russian and botany at The Ohio State University, graduating Phi Beta Kappa. His studies were interrupted by service in the US Air Force, stationed at Fliegerhorst Army Air field near Hanau, Germany. Roy received his PhD in Plant Pathology from Cornell University. He worked in Chicago as a plant pathologist for the USDA and Santa Fe Railway before returning to Ithaca to teach in the Department of Vegetable Crops at Cornell. His long career included research and extension work with onion growers across New York, as well as teaching classes in vegetable crop production. He retired in 2003 and devoted his time to his many passions. Roy was the Cornell liaison to the NYS Vegetable Growers for many years and was a key part of the establishment and growth of the statewide Vegetable Growers Meeting starting in the 1980’s. Roy had a passion for teaching and remembered not only student’s names years later, but could describe their personalities and interests. He certainly fostered a love of gardening and vegetable production in an entire generation of students. Roy is survived by his wife of 32 years, Eileen Bach; his beloved children, Tanya (Jacob) Bitterman of Rockville, MD; Robyn Ellerbrock of Urbana, IL; Bryan Ellerbrock of Ithaca, NY; and his adored granddaughter, Leah Bitterman. In lieu of flowers, memorial contributions may be made to Cornell Plantations. Calling hours will be on Wednesday, December 17, from 5-7 p.m. at Bangs Funeral Home. In lieu of flowers, memorial contributions may be made to Cornell Plantations. 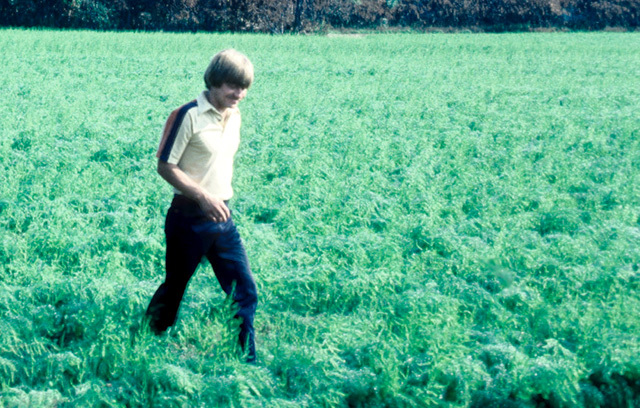 Undated photo of Roy in the field. Still in the market for a holiday tree? Not to worry, two Cornell University experts share their tips and tricks to pick and preserve the perfect pine tree. Brian Eshenaur is a plant pathologist, a certified New York State nursery professional and a Western New York-based educator with NYS IPM. 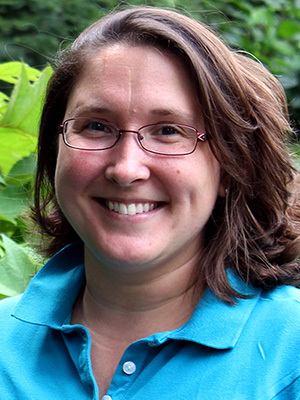 Elizabeth Lamb has a Ph.D. in plant breeding and is a senior extension associate with the Cornell Cooperative Extension’s New York State Integrated Pest Management program. “Despite the subzero temperatures that occurred early in the year and some subsequent winter burn on certain trees, the 2014 growing season was a good one for New York Christmas tree growers. Moderate summer temperatures and regular rainfall helped the trees at Christmas tree farms put on a healthy layer of growth. “The mix of trees being grown and available to consumers continues to evolve. We notice more Fraser firs than ever that are available this year and a nice mix of other firs and in some locations even spruce trees as well. Firs and pines have the best needle retention and can last for a month or more indoors. 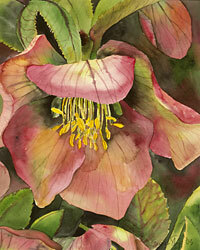 However if buying a spruce tree, plan to have it in the house for just a week to 10 days. Look for a tree with a good solid-green color. Needle yellowing or a slight brown speckled color could indicate there was a pest problem and could lead to early needle drop. Don’t be afraid to handle and bend the branches and shoots. Green needles should not come off in your hands. Also, the shoots should be flexible. Avoid a tree if the needles are shed or if the shoots crack or snap with handling. If possible, make a fresh cut on the bottom so the tree’s vascular tissue (pipe work) is not plugged and so the tree can easily take up water. Then, if you’re not bringing it into the house right away, get the tree in a bucket of water outside. Once your tree gets moved to inside the house, don’t locate it next to a radiator or furnace vent. And always remember to keep water in the tree stand topped off, so it never goes below the bottom of the trunk. County Cooperative Extension offices often have lists of local Christmas tree growers. You can also check the Christmas Tree Farmers Association of New York website at www.christmastreesny.org/new-york-state.html.